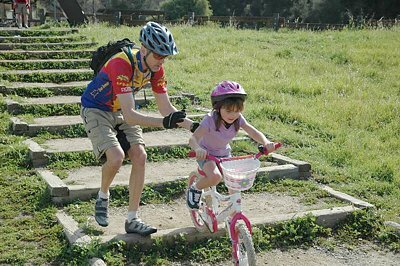 Riding down the stairs at Malibu Creek State Park during the Kids Club ride in March. See story. Solving the Speed Dilema Opponents to bicycles on singletrack trails give plenty of reasons why they feel bikes shouldn’t be there. And there is one that is actually legitimate; bicyclists sometimes go too fast, and some trail users feel their safety is threatened. It’s a simple fix; slow down when you see other trail users, or if you suspect there may be trail users in close proximity. Ideally, slow to their speed and make the encounter a pleasant one–like you’re passing a friend. If you do this, opponents will have nothing to complain about and might even enjoy the encounter! “The problem with multiuse trails [is others have to] default to mountain bikers because the bikes are so fast–the pedestrians and equestrians have been hit,” she said. While safety should obviously be of the utmost concern, there is little evidence that supports allegations that pedestrians and equestrians are being hit by bicyclists frequently or consistently. In fact, in the more than 24 years of CORBA’s existence, there are few documented accounts of bicyclists colliding with other trail users. As riders, we understand that there are some bicyclists who have the skills to ride at a higher rate of speed while under complete control. However, if the speed creates a hazardous situation for other trail users, then that speed is not justified. If the simple act of slowing down for blind corners and in the presence of other trail users could eliminate the argument for not allowing bicycles on trails, wouldn’t you do it? I look at it as belonging to a community, enjoying the outdoors together, albeit via different modes of travel. We should extend the kind of courtesy to each other on the trail as we would to our family members. Now’s your chance to ride with a CORBA Board of Directors member (maybe even more than one!) and talk one-on-one about the issues you care about most. 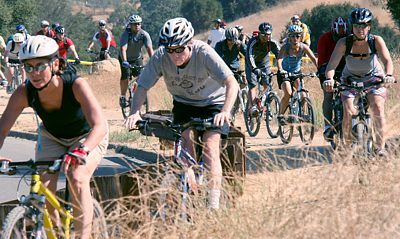 Best of all, you get to go on a fun ride in Malibu Creek State Park (rides will be easy to moderate with minimal climbing and last no more than 1.5 hours). Tell us what you think! The first ride will be this Saturday, April 2nd, at 1:30 pm after the monthly Skills Clinic is finished. View this Google Map for location and driving directions. 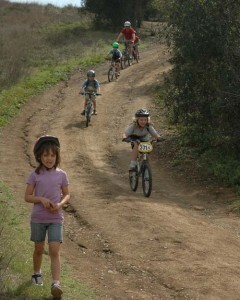 The CORBA Kids Club had another successful fun ride Sunday March 6 in Malibu Creek State Park. We started with a mini skills clinic, reviewing the importance of speed control, body positioning, and trail etiquette. The adults demonstrated descending the stairs, and those kids who were comfortable doing so also gave it a try. A few of them wanted to do it again and again. 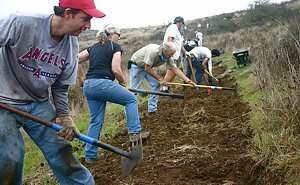 On Saturday March 26, about 40 Conejo Open Space Conservation Agency (COSCA) volunteers, including a dozen from CORBA and a half dozen from the Santa Monica Mountains Trail Council (SMMTC) trail crew, gathered to complete the eastern end of the Potrero Ridge Trail. This completes the multiuse trail that connects Newbury Park to Dos Vientos by dirt. 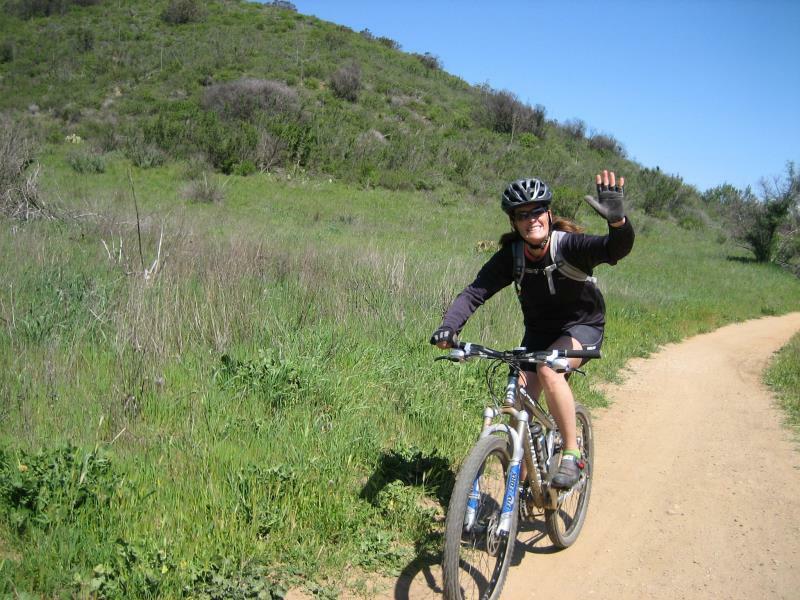 Now when makling a loop of the trails in Newbury Park, Dos Vientos and Rancho Sierra Vista/Satwiwa, the section between Wendy Drive and Reino Road can be done on dirt. Before, we needed to use 1.35 miles of road/sidewalk. Construction on this 1000 feet of trail began in the fall of 2009. Please read our blog article on the COSCA Spring Trailwork Day to learn more about this trail, and for a link to the photo gallery. This week, the Mountains Restoration Trust (MRT) will begin eradication of the invasive mustard plants along the New Millennium Trail. 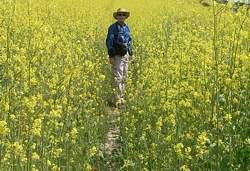 Each year by early summer the mustard can choke off the trail and render it near-impassable. This is especially true after above-average rainfall seasons like we’ve experienced this year. This picture from April 2008 shows how the New Millennium Trail looked when our trail crew was there, and how it will likely look again if no eradication effort is undertaken. CORBA has provided funds to the MRT to help support their efforts. This will save many days of brush-clearing trailwork in the early summer, allowing us to concentrate on other trailwork efforts. We thank the MRT for helping keep this much-loved trail rideable for all. Next CORBA Kids Club ride will be Saturday April 2. Details and registration. Next Beginners ride will be Saturday April 16th. See our Rides Calendar for details. Saturday April 2nd is the next skills clinic.